The Om Field: Is Jim Haslett Tough Enough? Among the seemingly endless storylines surrounding the 2010 Washington Redskins, one that has been largely overlooked is the potential career crossroads faced by defensive coordinator Jim Haslett. By accepting the job that two-time Super Bowl winning new head coach Mike Shanahan offered, Haslett accepted both great opportunity and potential for a fall. Succeed, and doors will reopen, including a possible return to the head coaching ranks. Fail, however, and the plateau Haslett found himself walking before Shanahan hired him could represent the highest level he will achieve again. When Shanahan accepted the Redskins head coaching job in January, one of his first orders of business was hand-picking Haslett to craft the Redskins a championship defense. If that wasn’t challenge enough, Shanahan made it even more challenging with his decision to scrap the 10th-ranked unit Haslett inherited, dismantle the 4-3 style defense the Redskins have traditionally played and install an aggressive, ball-hawking 3-4 style defense bent on wreaking havoc. Since his arrival, Haslett has preached an attacking style and implored his defense to “make plays.” The onus will be on creating turnovers, and he has made it clear that unlike previous regimes, his players need not fear being summarily benched for making mistakes or giving up the occasional big play. Haslett, with 25 years of experience in football, brings a brooding swagger to the job that at first blush makes his hiring look like a natural fit. After seven months of OTA’s, minicamps and training camp, Haslett’s players know by now that their new coach can talk the talk. 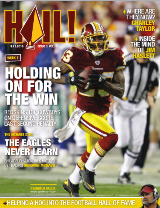 Grab your free subscription to Hail! Magazine to read the rest. You won't be sorry.